The word “humility” has some people thinking that to be humble, we must let others step all over us. We must be a doormat that will just let others do whatever they want with us. We must be so meek and regard ourselves so lowly that we accept anything when others abuse or demean us. That is far from the truth of what humility is. To be humble, according to the Bible, is to regard others as more important than us. And when we do so, God will lift us up. God will show us favor when we are humble. And when we pray, we need to come before God in humility, exalting His Name above all names. John the Baptist in Luke 3:16 exhibited great humility when he said, “I baptize you with water, but One more powerful than I will come, the straps of whose sandals I am not worthy to untie. He will baptize you with the Holy Spirit and with fire.” In Luke 3:16, John is referring to Jesus, whose sandals he is not worthy to untie. John had utmost respect for Jesus. He allowed Jesus to be on the center stage and be exalted instead of him. That is humility. And that is the spirit that God wants us to be in when we come before Him. 2. Pray and seek God’s face. To seek God’s face is to be intentional and genuine in going after Him and sensing His Presence. It is looking into His beloved eyes so warm and full of love. How can we seek God’s face? By praying and communing with God. By reading the Holy Bible and allowing God to speak to us through His Word. If we need answers to life issues, pray and read the Holy Bible. Seek His face and He will hear our prayers. 3. Turn from wicked ways. Stay far away from evil. Do not go near evil or participate with the wicked to do bad things. And if you had done something wrong, pray and ask God to forgive you. Be sincere in your prayers to seek God’s forgiveness for your sins. Not only will God forgive you, He will also remember your sins no more. That is so awesome. In summary, for God to hear our prayers, we need to be humble, pray and seek His face and turn away from evil. 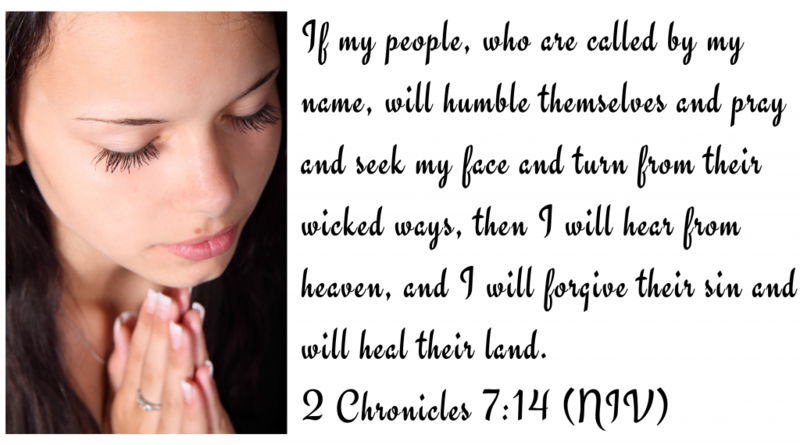 And the last part of 2 Chronicles 7:14 said that God will hear from heaven, and He will forgive our sin and will heal our land. Amen.